A polyprism is a figure made of congruent equilateral-triangular prisms joined face to face. Here I show all polyprisms of orders 1–5. Two-sided polyprisms may be reflected as well as rotated. One-sided polyprisms may be rotated but not reflected. The pictures show only two-sided polyprisms. 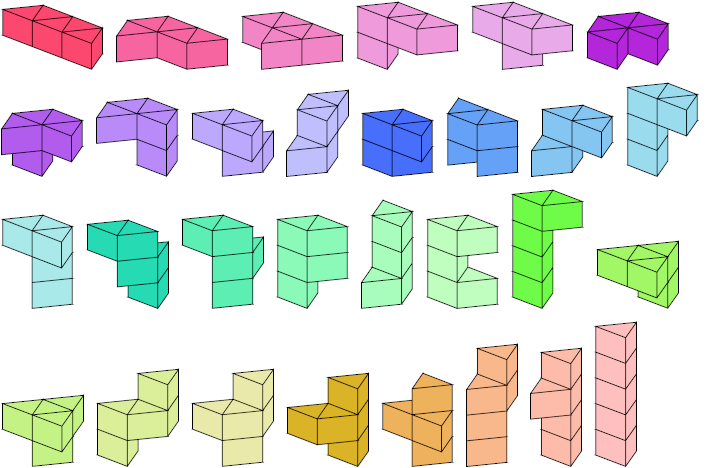 Polyprisms appear to have been enumerated first by Brendan Owen in 2001. His website, now defunct, enumerated and depicted one-sided polyprisms through order 7. Thanks to Alexandre Owen Muñiz for finding this out.